Entering through the door of the La Purificadora Hotel en Puebla my eyes were immediately drawn to the open feel of the 3-story hotel, as well as noting all of the artistic design elements that deftly combine the old and the new. An enormous white sculptural piece hangs from the soaring ceiling, a large stone stairway features a waterfall that runs down the center of the steps, and the open stonewall provides a view of the Iglesia de San Francisco, the oldest church in Puebla, built in 1535. 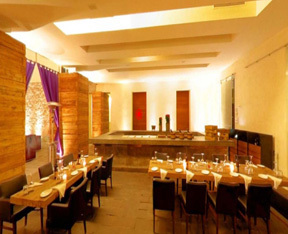 Interesting elements include the salvaged wood that was cut into blocks and used in various parts of the hotel on the floor, the rough hewn stone floor in La Purificadora Restaurant, the tiled rectangular swimming pool located on the third floor, the mirrored art piece that spells out the word SOUVENIRS on the stone wall, which is an artistic play of words as there is no souvenir shop, and the antique siphon glass siphon bottles on display that are a reminder of the hotel's former life as a purification plant. I stayed at La Purificadora Hotel en Puebla in late October 2009, and was delighted and surprised as I discovered the many secrets of the hotel. 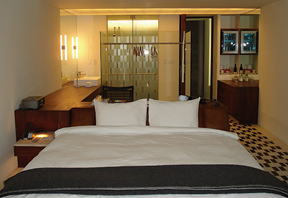 The hotel has 13 guestrooms located on 2 floors for a total of 26 rooms and each room is slightly different. My guestroom had a minimalist feel to it and featured a black and white tile floor, a clear glass closet with clear acrylic hangers, and a long wood desk with an aluminum desk lamp and an elastic strap desk chair that was placed against the back of the bed. The king bed was placed facing the large window, and featured a curved brown leather headboard and was dressed with a white duvet, four pillows, and a soft throw placed at the end of the bed. A purple cube chair was placed in the corner of the room on one side of the window and a purple ottoman was placed in the opposite corner. There was a long wood table with shelves, a large mirror with two attached light bars over the ceramic art sink, and an enclosed toilet and enclosed walk-in shower with bench, which featured onyx floors and walls. Amenities included a Samsung flat screen television, alarm clock, safe, iron, robe, slippers, hairdryer, umbrella, a selection of Kiehl's toiletries, pedestal hand-mirror, mini-bar stocked with alcohol and soft drinks, and an assortment of other interesting items for purchase. 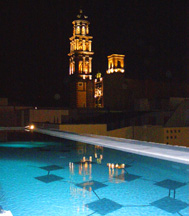 The hotel has a Spa, Business Center, and a Terrace Bar located on the third floor of the hotel where I enjoyed one of their creative cocktails before having an excellent dinner at La Purificadora Restaurant. A few of the highlights from my dinner included Squash blossoms filled with cheese and served with tomato broth (Flores de calabaza rellenas de quesillo con caldillo de jitomate); Shrimp Tacos (Tacos de camaron); Chalupitas with red sauce, duck confit, and caramelized onions (Chalupitas rojas de confit de pato y cebolla caramelizada); and Grilled Salmon with creamy yoghurt, Manzanilla sherry, and chipolte (Salmon al gill con cremoso de yoghurt de Manzanilla y chipolte). 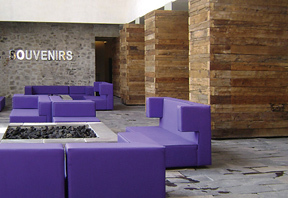 Since the hotel is open, careful thought has been taken to provide extra creature comforts such as the soft wool throws to wrap up in that are draped over the purple sofas next to the conversation fire pits on the lobby level, and also on the third floor. 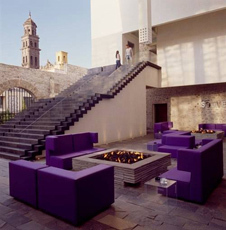 La Purificadora Hotel en Puebla is located in the heart of the historic center of Puebla and is next door to the Convention Center making it perfect for business or leisure travelers. 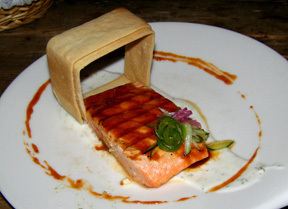 Read about La Purificadora Restaurant in the Restaurants and Chefs' Recipes section. Please read other articles on Puebla, Mexico in the Destinations, Hotels and Resorts, Restaurants, Chefs' Recipes, Gastronomy, and Arts sections.